The LTLLED Linear is the first light fixture designed exclusively for linear LED light tubes. This fixture takes advantage of the directional distribution offered by LED light tubes. It is designed with a light beam separation that eliminates the light concentration of a standard light strip. The results are an even illumination of the area with no hot-spotting. 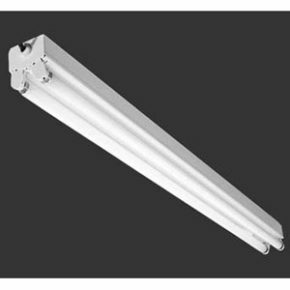 A 1-1 or better replacement of fluorescent tubes is achieved, at considerably reduced energy consumption. Available in 2’, 4’, and 8’ lengths in 1, 2, or 3 lamp configurations. One light asymmetric version is designed at an offset, making it ideal for cove light and corner applications such as parking garage perimeters. 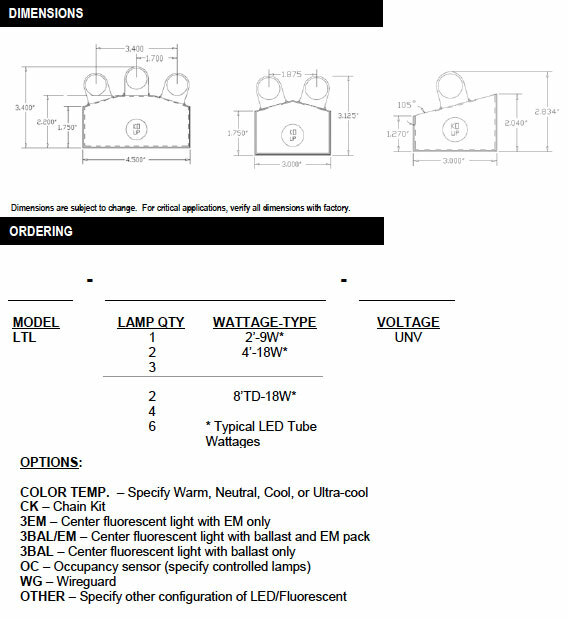 Three lamp versions can be equipped with fluorescent center tube for emergency back-up applications. All versions can be equipped with occupancy sensor for increased energy savings. This fixture is ideal for low ceiling parking garage applications where 24/7 lighting is required. Low profile wide distribution and asymmetric housings fit tight spaces while ensuring even light distribution in both open areas and garage corners. Can be fed through end or back of unit. Predrilled mounting holes for easy installation. Die-formed welded 20 gauge steel housing for strength, powder coated for corrosion resistance. Stainless steel cover screws for increased rust resistance. Ample knockouts for ease of installation. LED tube provided by RLE or others. Available in warm, neutral, cool, and ultra-cool color LED. All steel parts post-painted with smooth finish white polyester powder coat.